Many HVAC ducts are located outdoors either on rooftops or at ground level like the ones in this project. Radiation from the sun heats the surface of the ducts far above ambient temperatures. A standard duct has an R-value of 3.8 – 8. 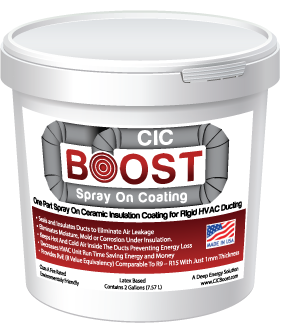 CIC Boost will add an additional 9 – 15 RvE (R-Value Equivalency) to the sprayed area blocking heat load, providing a continuous membrane, preventing moisture and condensation, lowers unit run time saving energy and money. 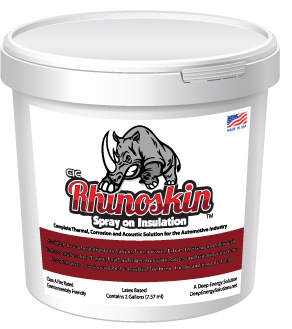 A 30 mil coating of CIC Boost was sprayed on to one of the units using the CIC Flex Application Spray Gun as shown in the video at the bottom of this page. 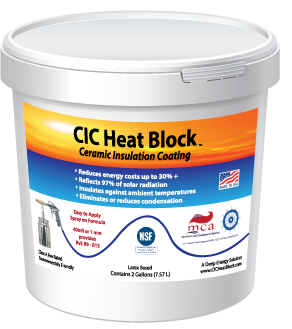 There were three goals to this project, 1) reduce solar heat loading on the ducting, 2) bridging the gap at the expansion joints where rubber is cracking, and 3) addressing the cracking duct sealant at the joints. Temperature was recorded with a FLIR TG155 comparing the temperature of the coated unit with the uncoated unit next to it as shown in the picture above. The readings were taken on 7/21/2016 at 12:00 pm. with an ambient temperature of 103˚F. The FLIR image displays hotter areas in orange or yellow the cooler areas are purple to blue with a range in between. The number at the top of the screen is the temperature at the cross hairs. Infrared cameras do not measure surface temperatures, they actually measure the intensity of infrared radiation (radiant energy) being emitted by the surface it is aimed at. These images show energy loss and savings through the metal substrate of the duct. Follow up temperature measurements were taken on 8/2/2016 at 2:00 PM. The ambient temperature was 89˚F - Both units were running and in the sun. Front of the coated ducting measured 5.1˚F higher. This is an example of conduction. The sun does not directly shine on this surface. The cold air within the unsprayed duct was passing through the metal and lowering the temperature reading demonstrating a loss of cold air. The coated ducting was keeping the cold air within the duct resulting in a higher outside reading. Click here for a video of the application and results.